Steel frame buildings provide a solid structure that can support all kinds of commercial usage. Whether you’re in need of an industrial building (like a warehouse) or something for agriculture (like a cattle shed), steel frame buildings can provide dependable structures built precisely to your needs. If personal touches aren’t essential, you could also opt for a prefabricated structure. Quick and easy to build, these offer a simple, time-saving option for small business owners. How are steel building prices calculated? What are the different types of steel frame buildings? You can read the specific sections that you want to learn about the most. Or, read the whole article to gain an overall understanding. We’ll provide guidelines on the steel building prices you can expect to pay. For more specific information, you should speak with suppliers – and Startups.co.uk can help with this. To compare quotes for steel buildings now, just fill in the form at the top of the page. 1. How are steel building prices calculated? Steel framed buildings prices are calculated in a number of ways, including by weight, by square metre, and by the costs of the structural steel itself. In this section, we’ll provide more information on the calculations involved. Working out the weight per metre of the frame is one of the key steps in the design process, and should usually be completed by a specialist structural engineer. This takes into account how much the frame weighs overall, as well as the individual parts. The complexity of the structure will affect the price too, as will the type of steel used and the cost of fabricating and transporting it. As such, a lower weight doesn’t always correspond to a lower cost. Calculating steel framed building prices by square metre (m2) is based upon the gross internal floor area (GIFA). This involves measuring the internal floors of a building, including areas like stairs, lifts or columns, as well as partition walls. Essentially, the GIFA is all floor space inside the building up to the walls that confine the space. This a standard used across all buildings constructed in Britain. The price of steel is very changeable, as it’s a worldwide asset (like gas or oil). Steel material prices can vary on a day-to-day basis, depending on changes to the stock market or the value of the pound. Other external factors can also have an effect, such as global events or logistical issues caused by the weather. 2. Which factors influence pricing? Location – you should take into account regional variations when figuring out steel building prices. For example, structures that need to withstand heavy snowfall or winds are likely to be at a different price point to those that will be exposed to higher temperatures. Features – the type and complexity of the features you want the building to have, such as windows and doors, should also be considered when finalising a budget. Labour – the cost for the time and expertise required to erect a steel structure professionally is likely to add to your final bill. In contrast, steel frame building kits prices are likely to be more budget-friendly as you don’t have to account for labour costs. Purpose – what the building will be used for may affect the overall costs. For example, a warehouse storing high value items or an industrial premises that handles hazardous materials may have specialist requirements that are likely to increase the price. Material – Sheet metal buildings prices can vary, depending on the type of metal you use. Steel is one option, but others include aluminium or iron. Within this, some more options include using galvanised steel, which has been coated with zinc to help prevent the material corroding. Stainless steel is another popular choice, as it’s easy to shape and similarly resistant to corrosion. Its ability to not rust or stain as quickly is what differentiates it from general steel, which may corrode more easily. Size – as the size of the structure increases, it’s likely the costs involved will as well. For example, large metal building prices are likely to be higher than those quoted for smaller structures. The design process is likely to contribute towards the overall costs too. Steel building costs can also be determined by the building type and height. For example, low level and high level buildings, as well as those used for industrial purposes, will all come in at different price points. As a guideline on steel buildings UK prices, custom sheds, garages and industrial buildings can range from £6,000 through to £20,000 approximately. Sheds and garages are likely to be at the lower end of that scale, with industrial buildings on the higher end. It’s possible to find lower steel frame building kits prices – for example, a metal garage could come to under £2,000, while metal sheds can be around £500. Be sure to factor in VAT and construction costs (if applicable) too. You could opt for second-hand materials or frames to help lower the costs. 4. 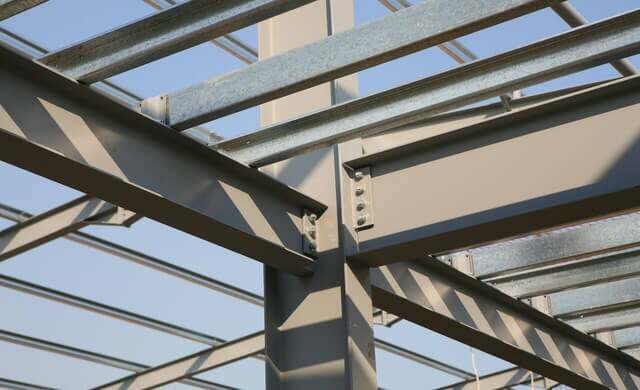 What are the different types of steel frame buildings? Steel frame buildings come in all shapes and sizes, and there’s a wide range of types to choose from. To help you choose the best one for your business, we’ll outline some of the types and some key information about them. Metal storage sheds – these can be both general purpose or used on farms specifically. Prefabricated – these are structures that can be easily assembled on-site. Industrial – warehouses and factories, for example, are ways in which steel frame buildings can be used for industrial purposes. Metal garages – these can be used to house cars and caravans, as well as industrial or agricultural vehicles (such as business vans or tractors). Commercial – steel structures can be used for retail spaces or offices premises. For example, pop-up shops and market stalls could be housed within steel frame buildings. Agriculture – barns, sheds and livestock facilities just a few potential uses for steel frame buildings in the agricultural industry. To find out more about farm buildings in particular, read our agricultural building prices page. Whether you’re just starting an agricultural business or you’re looking to work for yourself in the industry, read our how to start a farm business guide for more information about this kind of start-up. By reading this article, you’ve learned more about steel building prices, including how they’re calculated and which factors can affect the overall cost. We’ve also offered guidance on how to plan a budget for steel frame buildings, as well as the different types that may be available to you. Now what happens? Read our page on portal frame building costs for more information. Or, if you’re ready to find a custom quote for steel buildings for your small business, then fill in the form at the top of the page.